The other night I wanted to watch something on TV. We don’t have cable, so you’d think my options would be limited, but that wasn’t the case. With Philo TV and other streaming services, I had more than enough options to choose from. As you’ll see in this Philo TV review, cable TV is a needless expense, given all the options available through streaming services. We used to pay over $100 per month for our expensive DirecTV satellite subscription. Cutting the cord meant breaking our contract, but in just two months, we made the money back. We are now saving nearly $90 each month that we can put towards other things. Do you want to cut the cord and looking for a low-cost option? Below is our review of Philo TV and why you may want to consider them for your streaming needs. If you’ve never heard of Philo TV, you might think they are a relatively new streaming service, but that’s not the case. It actually got its start on college campuses across America. Philo TV has been around for years, quietly offering one of the best selections of lifestyle and entertainment content. They do this for under $20 per month and no contract. You can even try Philo TV for free for 7-days without having to provide a credit card, making it one of the easiest and most risk-free streaming services on the market. Philo TV is similar to other streaming services like Sling TV or Hulu Live. There’s one key difference with Philo: it does not include sports. If sports are really important to you, or you’re looking for how to watch ESPN without cable, you’ll want to consider Hulu Live or Sling TV. Those platforms make sports a priority, in addition to other cable content. If watching live sports without cable doesn’t interest you, then Philo could be an excellent choice. It specializes in entertainment and lifestyle programming and its base 40 channel package is just $16 per month. This makes it one of the cheapest streaming options available. Food, FYI, Lifetime, MTV and more! 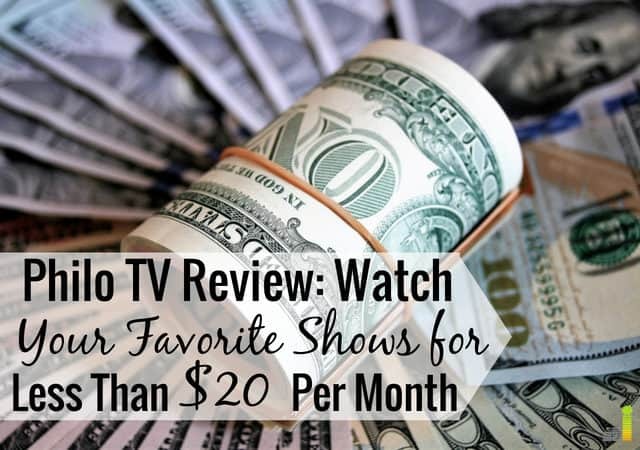 Plus, Philo TV offers an affordable way to watch my favorite HGTV shows like Love it or List It and Property Brothers. If you’re looking for how to watch HGTV without cable, Philo TV could be the perfect cord cutting solution for you. As mentioned above, the Philo TV channels list does not include sports or local channels. However, a digital antenna like the Mohu Leaf will solve that second problem for you quickly and cheaply. If you can live without sports, Philo TV has a lot to offer in its two channel packages. A&E, AMC, Animal Planet, AXSTV, BBC America, BBC World News, BET, Cheddar, BIG News, CMT, Comedy Central, Discovery, DIY Network, Food Network, FYI, GSN, Hallmark, Hallmark Drama, Hallmark Movies & Mysteries, HGTV, IFC, ID, Lifetime, Lifetime Movies, MTV, MTV2, Nick, Nick Jr., Teen Nick, OWN, Paramount Network, People TV, SCI, Sundance TV, History Chanel, Tastemade, TLC, Travel Channel, TV Land, Velocity, VH1, Viceland, and WE. AHC (American Heroes Channel), BET Her, Cooking Channel, Destination America, Discovery Family, Discovery Life, Logo, MTV Live, Nick Toons, Revolt, and Up. If you’re a fan of any of these nine channels, the $4 price bump may be worth it to get access to the full library of Philo TV content. Either package makes Philo TV the low cost leader in streaming services, along with Sling TV. Perhaps one drawback to Philo TV is that it currently only works with Roku devices. Unfortunately, that means you can’t use Philo TV with an Amazon Fire TV or Amazon Fire TV Stick. Thankfully, the Philo TV app does work with iOS and Android operating systems as well as the iPhone app and Chrome and Chromecast. This means if you have a laptop or smart phone, particularly one with projection capability, you have everything you need to watch Philo TV. As of the writing of this Philo TV review, they are working on other device capability so if you don’t see your streaming platform listed, keep checking and chances are it may be added. Philo TV can also be used with the TV Everywhere app. That means that you can watch nearly all of the Philo TV channels through TV Everywhere. Just download the TV Everywhere app and use your Philo TV login credentials to watch it there. Since being launched by Time Warner Cable in 2009, the TV Everywhere app has received criticism from some cord cutters who don’t view it as a true solution to cutting cable costs. While many networks use TV Everywhere, they require a cable or satellite credential to login. The Philo TV app changes that by eliminating the contract and giving you another convenient way to access some of your favorite TV shows. Can you watch Philo on multiple devices? The simple answer to this question is yes, you can. In fact, you can watch Philo TV on as many as three devices at once. This is higher than other streaming platforms, making Philo TV an attractive choice, especially for the price. Does Philo TV have A DVR? Philo TV offers live content as well as on-demand content. The Philo TV service even offers a free cloud-based DVR, like many pricier streaming services. In fact, about the only thing Philo TV doesn’t offer is sports. There’s no limit to how much you can record on the Philo TV DVR. Even better, the Philo TV DVR lets you rewind and fast forward live TV. There are very few streaming services that offer this. Hulu with Live TV does, but at nearly twice the cost. However, that higher cost comes from the live sports content that is included with Hulu Live. Again, if sports don’t matter to you, there’s no reason not to go with Philo TV. The only downside to the Philo TV DVR is that your recorded content disappears after 30 days. Like most streaming services, Philo TV offers a free 7-day trial. The Philo TV free trial is very easy to get. In fact, it might be the easiest on the market since no credit card is required to enjoy it. All you need to do to get the Philo TV free trial is to give them your cell phone number. After two days, they will ask for your credit card number. They’ll give you five more days to enjoy the streaming service for free, after which point you’ll begin to be charged either $16 or $20 per month to keep enjoying the contract-free streaming lifestyle and entertainment content. There’s a lot to like about Philo TV. In this Philo TV review in fact, it’s hard to find things not to like. Some of the pros of choosing Philo TV as your streaming service include Philo TV’s channels. 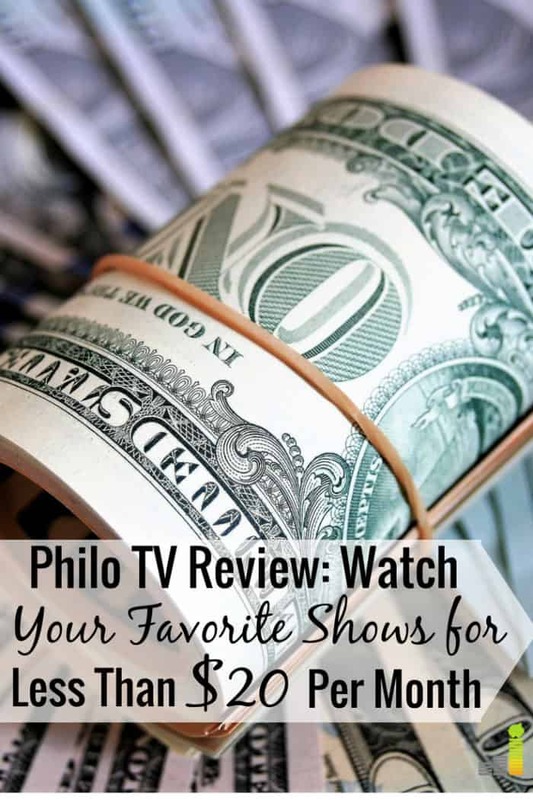 If you’re like me and enjoy having HGTV on in the background so that you can catch up on the latest episodes of Flip or Flop or Caribbean Life, Philo TV is one of the cheapest ways to do it. Philo TV’s low cost of $16 per month provides on demand and live access as well as the ability to record the shows you can’t be home to watch on the included DVR service. If you’re in an expensive cable contract, Philo TV offers a cheap way to cut the cord and shave as much as $100 off your monthly cable bill. Just think of what you could do with an extra $100 each month. You could pay down debt. Start an emergency fund. Save up for a new car or vacation. Start investing. The possibilities are endless. Another pro to Philo TV is the fact that you only need to give them your phone number to get two days of service for free. After that, a credit card secures an additional five free days. Something we didn’t mention earlier but which can be considered a pro is the Philo TV viewing experience. The platform provides good picture quality on a range and variety of devices and the viewing interface or menu is easy to navigate. The experience feels the same from one device to another, which is nice as it gives you a more enjoyable experience every time you watch TV with Philo. About the only cons that we could find are the absence of sports and live sports content. With Philo’s low cost, it’s not surprising as sports content is the most expensive for cable, satellite, and streaming service providers to offer. If you’re looking for a way to watch live sports content, consider other services like Hulu with Live TV or Sling TV, both of which offer ESPN, FS1, and a host of other sports channels for about twice the cost of Philo TV. Another drawback to Philo TV is that it does not include the ability to get local channels. Other streaming services like Hulu with Live TV do offer this ability. However, this isn’t a cause not to get Philo TV if you like everything else about it. We get local channels easily outside of our streaming services with a digital antenna. We have two Mohu Leaf digital antennas and with them are able to get ABC, NBC, FOX, and CBS as well as Public Broadcasting channels and several other stations, all for free over the airwaves. The quality is great too. It’s not like the snowy rabbit ear years of the past. The Mohu Leaf digital antenna is easy to set up and use. If you live in a larger city, you may get more than 30 channels just with a digital antenna, so don’t let the lack of local channels keep you from seriously considering Philo TV. One other minor downside to Philo TV is that DVR content deletes after 30 days. However, the fact that a cloud DVR service is included in the $16 per month price tag more than makes up for the 30 day deletion in our opinion. When you look at all the cord cutting options and streaming services on the market today, Philo TV stands out as an attractive option. We like the diverse channel lineup that Philo TV offers. While local channels aren’t included, this isn’t a reason to pass over Philo TV. Comparing the various streaming services on the market today, Philo TV has to be ranked with Sling TV as the low cost leader. Again, if you can keep your enjoyment of sports limited to what airs on your local channels, there’s no reason you can’t get all your streaming service and TV entertainment content needs met with Philo TV. If you’re on the fence about Philo, take advantage of their free 7-day trial to test it out and see if you like it. If you don’t, you’re not out any money and if you do, you have a new, lower cost way to enjoy your favorite TV content. Would you pay less money to not get sports from a streaming provider? How much do you spend on cable each month? What’s one TV network you can’t live without? Recent Cord cutter here! I paired YouTube TV with Philo and it’s and awesome combination. For less than half of what I was paying Dish network I’m getting all the channels I ACTUALLY watch without all the dreck. I’m not a sports guy so it’s perfect. honestly I wish YouTube TV would have a no sports option because I’m sure it would be 20 bucks a month less. Do you have any idea if I know will ever offer any news stations like Fox news? No idea, unfortunately Steve. I’d imagine they won’t be adding it soon as news & sports channels tend to be more expensive to offer. I believe you are incorrect about FireTV as I am streaming Philo. If OTA local TV was a possibility I would have cut the cord and subscribed to Philo. Next best is You Tube Live (Googlevision?) but they don’t have PBS. Completely understood Alma. Getting local OTA is not that difficult to do. Here’s our guide on how to do it. I’m not a tech person by any means and it’s VERY simple to accomplish.